A story about the lives of two young slum kids who get tempted by Pizza offered at a Pizza joint opened near their slum. The story describes emotions and dreams of these two kids and wonderfully portrays their cravings to get a taste of the delicious pizza and what all they do to collect money for buying it. So what actually happens when they have the money to buy it? Well that's Kaaka Muttai! Centered around a slum in Chennai , the story describes how a pizza joint changes the life of two young kids who live in the slum. The story begins with a small plot of land being sold for the purpose of construction of a pizza joint. This ground happens to be the playground for the slum kids. The pizza joint is inaugurated by Simbu and the sight of the pizza tempts the kids at that moment itself. These two kids earn the nick name of Chinna Kaaka Muttai and Periya Kaaka Muttai due to their inability to afford normal eggs that makes them resort to drinking crows egg. Their mother (played by Aishwarya Rajesh) has a difficult task of managing the home and shuffles between home and the lawyers office to get her husband out of jail. The grandmother character is as important as the mother and the two kids. The combination of the four have ruled the first half. The burning desire to get a taste of Pizza grows intense and they resort to different activities such as stealing coals from the railway yard ,ferrying drunkards from the bar to their homes, distributing pamphlets and so on. After collecting the required amount , they are thrown away by the Pizza joint watchmen who calls them as 'Kuppathu Pasanga' ( Slum boys). Their friend Palarasam, the railway lineman who also allows them to take(steal) coals from the railway yard informs them that they need to buy new clothes to enter the joint. After arranging the necessary amount and the clothes, they arrive back at the pizza shop only to be thrown out again and this time they are deeply humiliated and beaten by the shop manager. The incident is recorded on a mobile phone and somehow two small time rogues or mischief mongers to be precise (played by RJ Ramesh and Yogi Babu) get hold of this video. They etch a good plan to bring down the pizza joint by planning to get a ransom from the pizza owners. A series of events take place that includes the two boys disappearance, their search, their grandmothers sudden death and a protest plan. But what happens when the guys are found is something that would drag a smile on your face. This is a heartwarming story that is not only intriguing but also will make you ponder. It will melt your heart and make you feel for such innocent kids who don't have much in their life but dreams. Yes dreams don't come up with a price tag. Aishwarya Rajesh who plays the mothers role has lived it up. She has clearly justified the role of a mother. The railway linesman role is an important character that added another feather to the plot. In short Manikandan has managed to put up a very good show with not so well known actors. The ending is interesting and it will make you smile. You will laugh at several instances such as the scene where the grandmother tries to cook a pizza out of dosa and places where the kids try to sell a stray pet dog for 25 grands. Another important role was that played by RJ Ramesh and Yogi Babu. I would see a Senthil and Goudamani out of the two. Their chemistry glowed perfectly and of course not to mention the two little boys who did their task neatly and flawlessly. Chinna Kaaka Muttai was too cute. I should say that! Not to forget the music by GV Prakash - so pleasant to the ears, adding the value add to the team. An awesome team to be honest! This movie gives a strong and a meaningful message to the world. Generally people do not have a very good perception about those living in slums. We should remember that even they are humans and they have the right to wish . That may be beyond their reach but everyone has the right to dream. The boys almost give up on their dreams of getting to taste the pizza but for that they toiled hard. If you have dreams on your eyes then no one can stop you from reaching it. This movie gives an insight about the life of people who live in the slums in adverse conditions, their struggles , quest for existence and survival! I give 4.5/5 for Kaaka Muttai for the marvellous story. This is refreshing and the characters will stay on your minds forever. At least they made me smile! The movie has been screened at several movie festival and it has won the following awards till now. 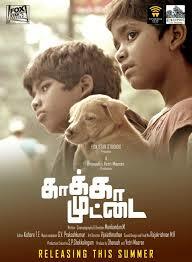 Here is the trailer for the National Award winning movie - Kaaka Muttai.